Was there a 3rd tornado in Md. during Friday’s severe storms? The National Weather Service is looking into the possibility that the storms produced a weak twister between the Potomac River and Charlotte Hall, Maryland. 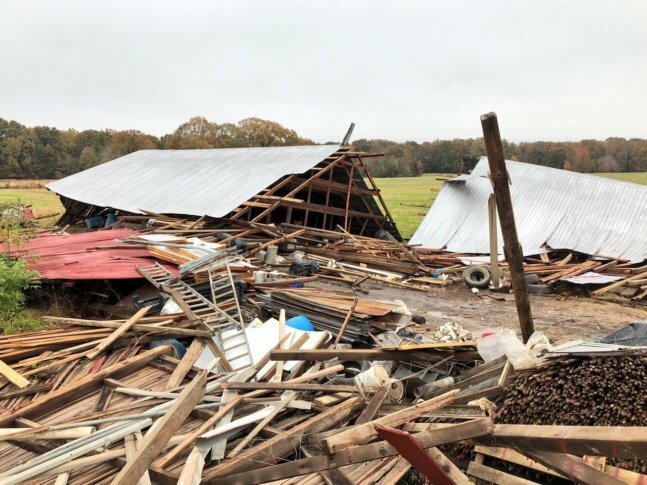 Editor’s Note: After surveying the damage, the National Weather Service has concluded that a south-to-north burst of non-tornadic wind was responsible for the damage in Charles County. NEWBURG, Md. — Sporadic wind damage occurred late Friday in the Allens Fresh area of Charles County as strong storms blew through. And the National Weather Service is looking into the possibility that the storms could have produced a weak tornado between the Potomac River and Charlotte Hall. High winds pushed over a tractor trailer on the U.S. Route 301 Nice/Middleton Bridge as the storms swept across the Potomac shortly after 10 p.m. The bridge was closed for nearly three hours to right the truck, which was leaning against the concrete wall of the bridge. A focused area of wind damage occurred about 2 miles north of the bridge in Charles County. The fascia off a gas station canopy was torn and several trees toppled along Maryland Route 234 and Glasva School Road. Less than a mile east of Route 301, a sturdy barn collapsed. The owner said the structure was constructed in the early 1980s and was well built. The roof was blown into an adjacent field. Minor tree damage could be seen farther east near Penns Hill Road. A tornado warning was issued for parts of Charles and St. Mary’s counties at 10:25 p.m. A second tornado warning was issued 15 minutes later for areas farther east. The weather service said it is seeking reports of additional damage in the rural areas between Popes Creek and Charlotte Hall, where doppler radar indicated a possible tornado. Two tornadoes were confirmed Friday night as the line of storms moved east, one in Mount Airy and another in Baltimore, where two people were killed and another person was injured when a warehouse collapsed. The last time a tornado touched down in Maryland in the month of November was in 2010. That tornado damaged parts of the Perring Parkway Shopping Center in Parkville, less than 10 miles from Friday’s deadly tornado in Baltimore. Only about a dozen tornadoes have been recorded in the state during November since official recordkeeping began in the 1950s.